hailing from a species that lived deep in the underground of a floating volcanic island until a massive eruption launched their entire civilization to the surface. He’s a complete hot head — steaming, fuming, and quite literally erupting over almost anything. 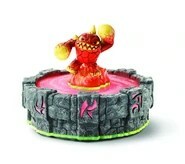 To help control his temper, he likes to relax in lava pools, particularly because there are no crowds. 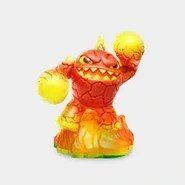 Eruptor is hot-headed and strongly dislikes evil doers. He enjoys relaxing in the lava pools in order to help control his temper. He also has a habit of burping uncontrollably as shown in a commercial for Skylanders. 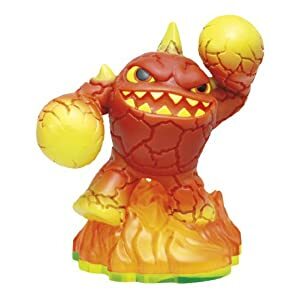 Eruptor has the power to hurl and spew fireballs of molten rock, and unleash a lava plume all around him like a volcanic eruption. 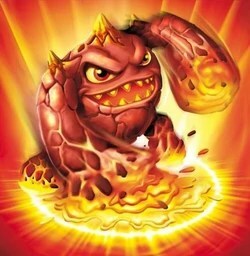 Eruptor is a lava monster Skylander in Skylanders: Spyro’s Adventure. 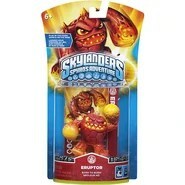 Eruptor is of the Fire Element.